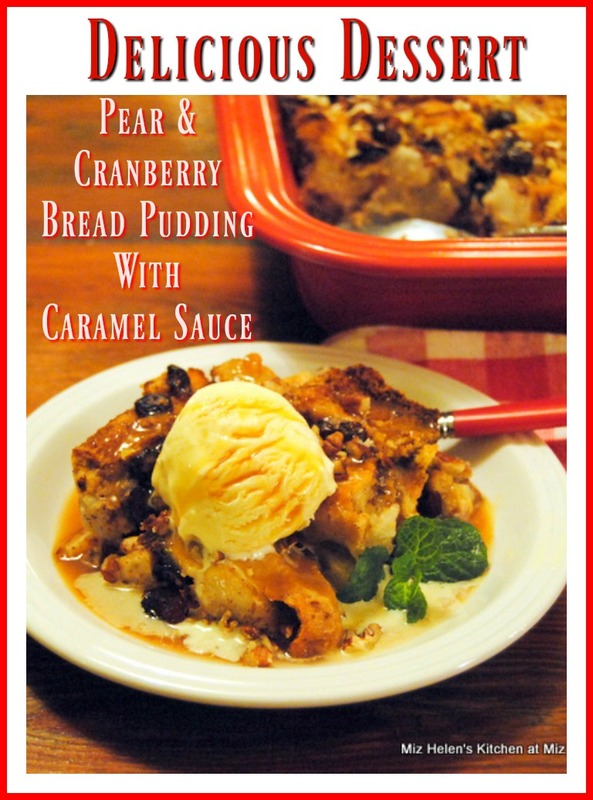 We love bread pudding, it is always so comforting and full of flavor. 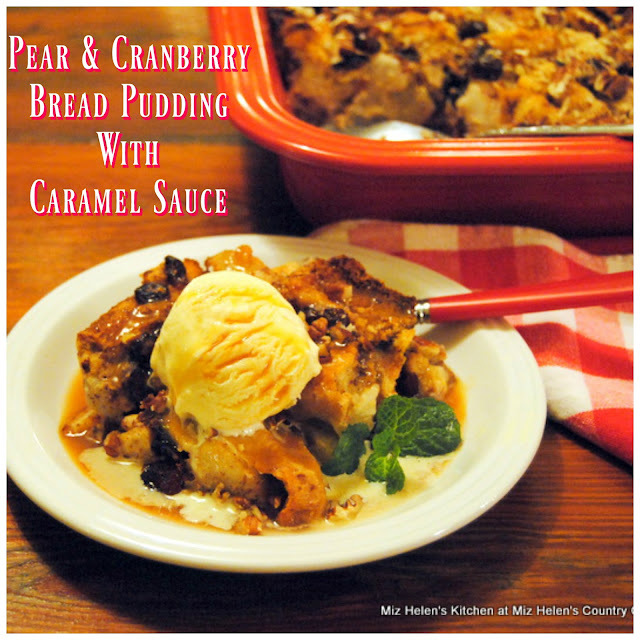 I made this bread pudding with some of the pears that my neighbor gave me, those pears are so delicious. I added some dried cranberries and pecans then drizzled some caramel sauce to finish the dessert. This one sure didn't last long, next time I will make a bigger one to enjoy a little longer. I love recipes that just happen, sometimes they are the very best! In a large mixing bowl, place the bread cubes and melted butter, toss really well to coat. Stir in the pears and cranberries. Spray a 9 X 11 baking dish with a cooking spray, then transfer the bread and fruit to the baking dish. In a medium mixing pitcher, mix together the eggs, half and half, 3/4 of the caramel topping, brown sugar, cinnamon, all spice, nutmeg,and salt. Whisk the mixture together until completely combined. Slowly pour the egg and milk mixture over the bread and fruit. Press the top of the pudding lightly to help the bread soak up the liquid. Let set for 20 minutes. Bake in a 350 degree oven for 55 to 60 minutes, until lightly browned on top and the center test clean. Remove from the oven and set on a cooling rack then sprinkle the pecans on the top of the pudding. Cool on the rack for at least 30 minutes. To serve, garnish with ice cream and drizzle the remainder of the caramel sauce on top. Then Its Ready To Enjoy! You are just in time today to enjoy a nice serving of this delicious bread pudding. Thanks so much for stopping by to spend some time with us. I always look forward to your visits and hope you come back to see us real soon! What a fabulous flavor combination and so seasonal too. Yum! Pear and cranberry sound like the perfect festive flavor combination! Wishing you a wonderful holiday season. I'm running way behind!! I wanted to make sure I stopped by to thank you for sharing at the What's for Dinner party last week. Hope to see you there again this week! I love any dessert that you serve with a scoop of ice cream - that's just the best!